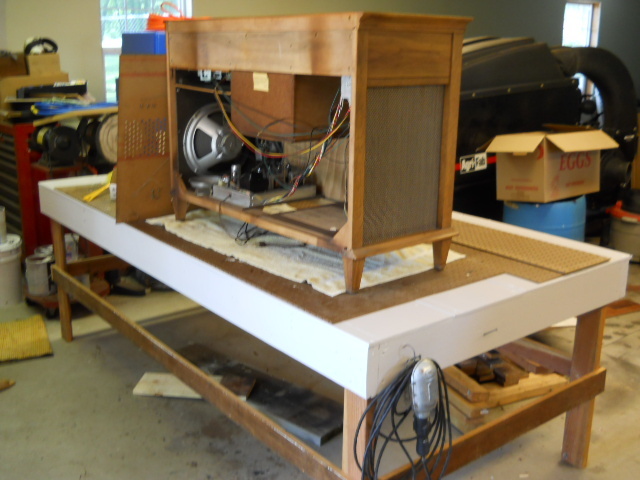 My electronics bench is upstairs in my garage. I'm too old to be lugging console stereos and other large items up those steps so I can work on them. I have been using a makeshift workspace consisting of a couple rickety sawhorses that have 2X4's stretched between them, with a half-sheet of plywood on top of that. Handy, yes, but normally stacked with junk so I can't work without clearing a path first. Then this setup was so unstable that I was afraid of loading anything heavy on it. I have a sturdy work table with my drill press, a grinder, a small vise on it. It is not very good for furniture items. I wanted to build something better, but never got around to doing it. A neighbor got into a minor traffic accident while pulling his 4'X10' tilt-bed trailer. He was hit in the rear at a stoplight by a driver who was on his cellphone and not paying attention to what he was doing. 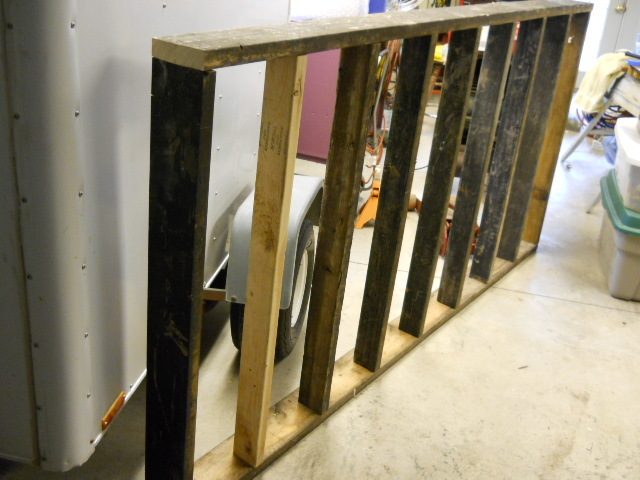 The trailer was empty, but suffered some slight damage to the wooden bed and it bent up some of the metal framing. The other driver did not have insurance, so the neighbor was left to pay for the damage himself. He had the metal framing fixed. He decided to just replace the entire floor rather than to patch it. So all the bed floor except for a small part on two boards was still perfectly good "Yellawood" now laying on my burn pile. I decided to use the undamaged treated 2X6 lumber for the framing for my new work table. Since I had plenty of material, and it was free, I made my table 4'X8' and used the 2X6's for framing. I put 2X6 studs, 12" on center, to reinforce the table, since cost was no object and all that lumber was just going to be burned. I made 32" 2X4 legs, since I did not get any free 4X4's. 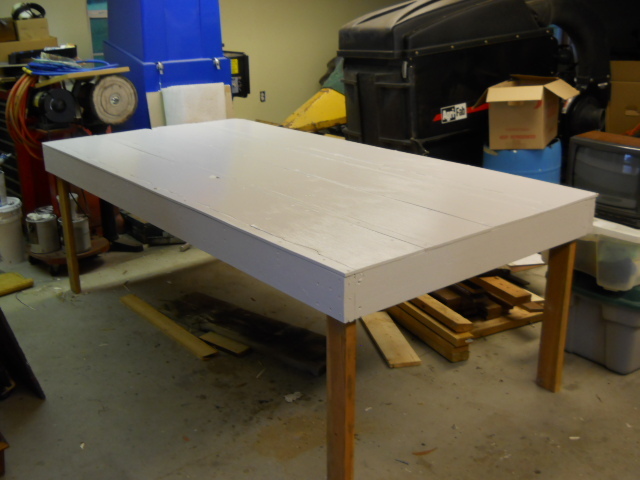 I found four pieces of used Masonite siding we took off the house and used that for the top of the table. I'd like to ultimately find a 4X8 sheet of Formica to cover the top. The only cost for this table is a few screws (I had those, but they were new) and my time. This baby should be stout enough to park a console stereo or TV on. I could probably park a small car on it. I took some pictures and will post those when I get the chance. I'm psyched about my work table. Keeping junk off it so I can work will be the hardest part. I'd love to see pictures, also. This is the frame as I was roughing it in. One of the side pieces had a pretty good warp to it, so I crippled in some 2X4's for support so I could get it square. I replaced these with 2X6's in the final product. Here is the table almost done. I added some supports between the legs to make it stronger. I have stood on the table with the stereo on it with no problem. Here, I have my Magnavox stereo on it. There is plenty of room to work now. This table turned out well for being made out of 99.9% trash. Looks like it will be big enough for most anything. I thought at first that a 4'X8' work table was fairly extreme. It is really not too large. It is light enough that I can move it if I need to. I've seen tables like that even have carpet covers on them. I like to put a towel or something under what I'm working on. If I drop a fastener, it tends not to bounce as much with a little cushioning to fall on. I'm too sloppy for a carpeted surface. I believe we are talking about the same concept.